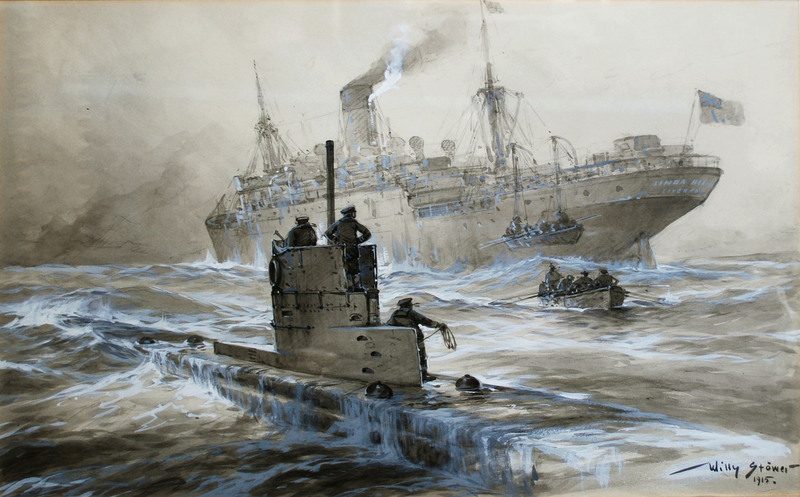 In the opening days of WW1, Unterseeboots, better known simply as U-boats, proved to be a potent and constant threat to Allied ships, with one U-boat identified as SM U-9 infamously killing nearly 1,500 British sailors in less than an hour by sinking three armoured British cruisers on September 22, 1914. That same U-boat would go on to sink over a dozen British ships during its naval career, with targets ranging from small fishing boats caught in open water to the Edgar-class protected cruiser, HMS Hawke. The reason for the U-boat success in the early going of the war was, in part, due to the fact that when they were submerged they were undetectable by technology of the day. Another factor that played into German hands is that the Allies, especially the British, consistently downplayed the danger posed by submarines and their value in combat. In fact, at first British Naval brass simply refused to acknowledge that U-boats were sinking ships. For example, the aforementioned actions of U-boat SM U-9 were initially attributed to mines. In short, British Naval officers had little faith in the potential of submarines and wrote them off as a mere fascination that had no real potential in combat beyond novelty. Thus, they did little at first to try to come up with viable ways to combat them. Things got real, however, when U-boats like SM U-9 began targeting British supply ships, almost bringing the country to its knees when it found itself unable to secure even basic provisions for its citizens and factories. A solution was needed. But how to take out a target that is capable of disappearing at will? It was quickly noted that one weakness of the U-boat was that it needed to use its periscope to mark its target before attacking. This presented a brief, but exploitable window of opportunity to attack the craft in some way. But how? 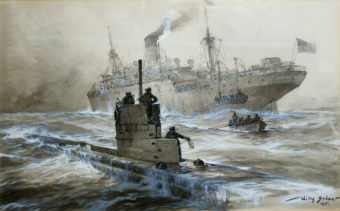 Up until the introduction of depth charges in 1916, while mines and large nets were utilized to protect certain areas with some minor effect, the conclusion of the Admiralty Submarine Attack Committee was that the best thing to do was simply for ships to either run away from or try to ram the U-boats when the periscope was spotted. Naturally, beyond risking damage to your own vessel, getting closer to the thing that’s about to shoot you with an otherwise somewhat unreliably accurate torpedo isn’t ideal, nor is necessarily trying to run away when you’re already a marked target. However, it is at least noted that with the periscope up, U-boats couldn’t go faster than about 6 knots and, as stated, torpedoes of the age weren’t terribly accurate or reliable so the more distance you could get between you and the U-boat the better. In the end, these two methods weren’t totally ineffective, but a better solution was still needed. This all got the wheels turning among the military think tanks, with the result being some rather humorous proposals as to how to solve the U-boat problem, with particular emphasis put on somehow taking out the periscope. After all, without the periscope, the U-boat’s only way to target a foe would be to completely surface, making it a relatively easy target for more traditional and accurate weaponry. With proper escorts for the supply ships, this could easily solve the U-boat problem. But how to take out the periscope? A suggestion by the British Board of Invention and Research was to train seagulls to fly at the periscopes, which would both make the presence of the periscope more apparent and potentially obscure the vision of the person looking through the periscope long enough to take action… To do this, it was suggested that they feed seagulls in certain regions they wanted protected through periscope like devices. Next up, there was a suggestion to simply put a type of paint in the water with the hopes that it would get on the periscope lens, blinding the operator. Going back to animals, a sea lion trainer called Joseph Woodward was hired to look into the possibility of training sea lions to detect U-boats and then hopefully alert the British of their presence. Unfortunately it isn’t known whether this method was effective, though the Royal Society does note that the training of at least some sea lions was performed. We presume given that the program wasn’t expanded beyond trials that it wasn’t terribly effective or perhaps not practical. As you might imagine, none of these methods went anywhere. But this brings us to the rather absurd method that does seem to have been put into practice. In the early days of the war, sailors were put on small patrol boats, all equipped with the latest and greatest in anti-submarine technology- large hammers and bags. They were thus instructed that if they saw a periscope popping up to the surface, they were to try to get close to it, then have one person place a bag over the periscope while another got their Whack-A-Mole on in an attempt to destroy it, hopefully all before any target could be identified and a torpedo launched. Exactly how effective this tactic is isn’t clear but we do know that it was popular enough for at least one senior officer aboard the HMS Exmouth to enlist the help of burly blacksmiths with extra large hammers to patrol with sailors aboard the smaller boats. With their amazing hammering abilities, both in strength and blow accuracy, presumably it was hoped they’d do a better job than your average sailor at quickly taking out a periscope. Of course, as more sophisticated technologies were developed, this tactic, sadly, became obsolete. But never forget for a brief, but glorious time in history, there was a guy who could claim his job was to hunt submarines with a giant hammer, no doubt giving a cry of “For Asgard!! !” before smiting his foe. Are their any documented cases of successful periscope bashing?